Milan Medical is an easy to use and cost effective electronic medical records and billing service. Providers can use virtually any internet enabled computer to access our system and enter information. Providers enter their progress notes into the system and, other than approving the notes, no other action is required for the services to be billed. For fully supported payer sources, a billing file is automatically created and uploaded, eligibility is automatically verified, authorizations are automatically uploaded and the results processed. For other payer sources, completed CMS-1500 forms and/or various reports can be used to manage the billing process. The resulting payments are sent directly to the organization providing the services. 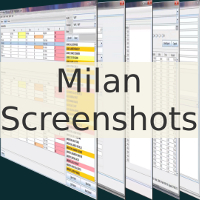 The organization is then invoiced on a monthly basis, by us, for services rendered through Milan Medical. All software, support, training, and other expenses are included in the base price. You can also fill out our "Request a Demo" form to be contacted by one of our representatives. Software and updates are included. Costs about 1 percent of claims paid for OPBH. No server hardware or software to buy or maintain. Cost is not based on the amount of support or training needed. Process consulting for insurance payments. Professionally maintained servers with off-site backups. Batch eligibility, authorization, billing and reconciling. No need to manually upload, download, or back up files. Reliable access via the Internet 24 hours a day, 365 days a year. OK Medicaid, OK DMH, and Medicare billed electronically. Simplifies SURS, DMH, CARF, and JCAHO compliance. Integrated documentation and tracking of all payor sources and contracts. Time-tracking and time sheet management. Reduce paperwork by using digital signatures. Unit-usage tracking with indicator on progress note. Software automatically installed and kept up to date. View treatment plan and enter progress notes while offline. Entering the same information twice is virtually eliminated. Validation greatly reduces CDC, request, and billing denials. Color-coded overview of clients, treatment plans, and billing. Robust reporting mechanism with PDF and spreadsheet export. * Mobile device access requires additional software to run.